I think we can agree that easy & fast patterns are always a positive! 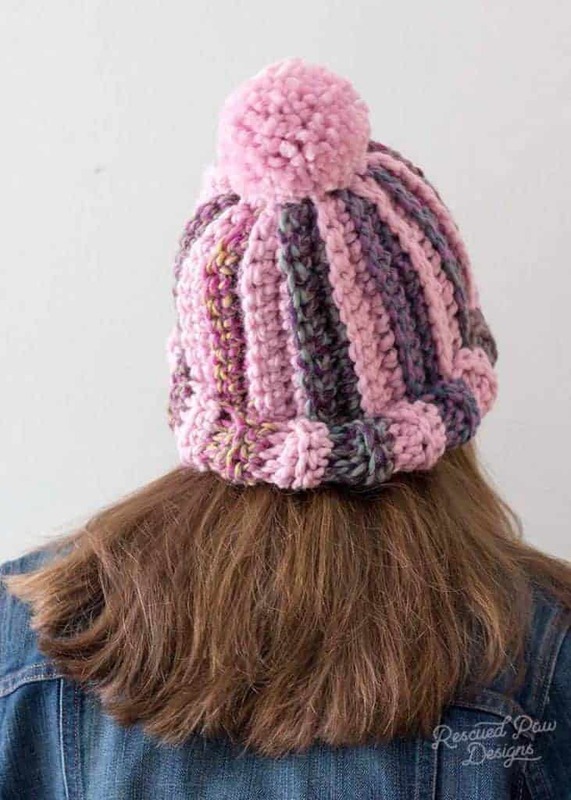 This striped crochet hat pattern fits that description and is the perfect easy pattern to try. 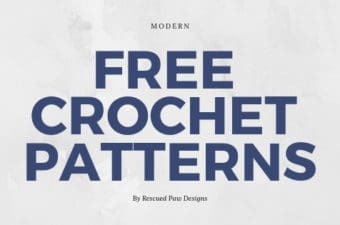 Read on down to get this free hat pattern to get started today! 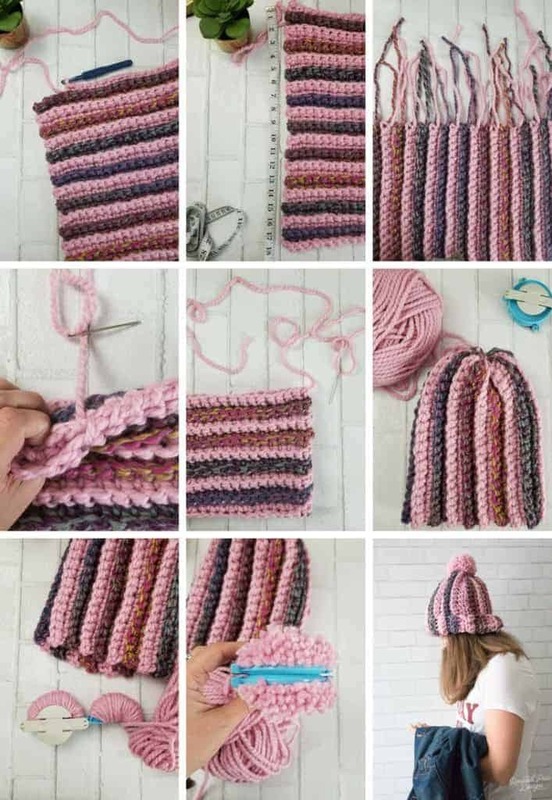 To make this easy striped beanie you will need some chunky yarn. I used Lion Brand Wool Ease Thick & Quick in Blossom and Astroland. The Astroland colorway is pretty awesome because it gradually changes colors and can give the beanie a unique look every time it is made. I made my example purposefully long so the end could be folded up to make a brim. MINIMAL WEAVING IN OF ENDS! As you can see this is a striped hat which means the dreaded color change and weaving in ends. But, since this is a pretty quick project that part isn’t to bad so don’t worry! 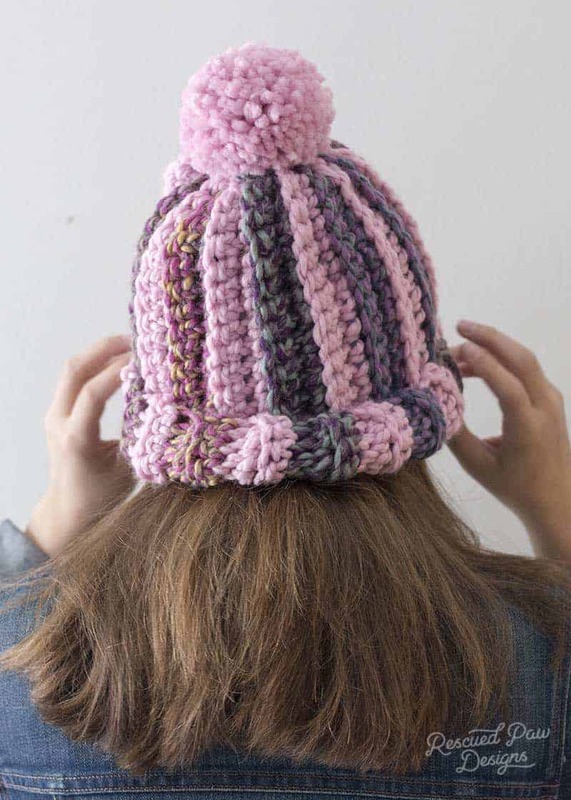 After you are done weaving in the ends the last thing to do finish up this easy striped hat is top it with a pom pom! I used the large Clover Pom Pom maker (I found mine on Amazon) and made it as a chunky as I possibly could to guarantee it would be an extra fluffy pom! To finish up the hat attach the pom with a yarn needle and weave in the loose pom ends on the inside. 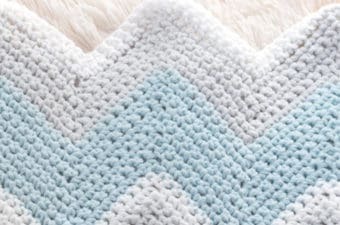 Super easy pattern to try! I do get asked quite a bit about my policies regarding patterns. I do have a full page about my disclosures , policies and more. “Click Here” for more information. 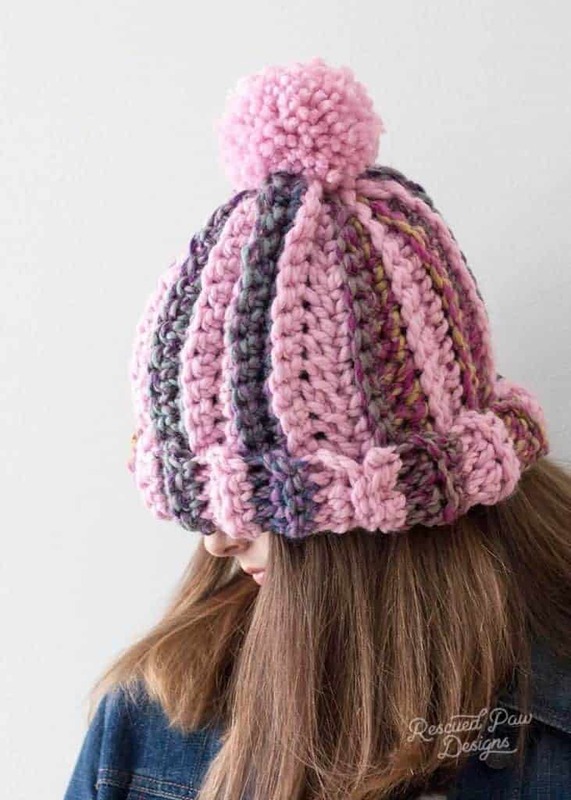 For this striped hat pattern they policies are as follows..
“Click Here” for the free tutorial on how to change colors in crochet. Foundation Row: starting with the colorway blossom chain the length you wish for the hat (the height) I did mine 12 inches long so i would have enough left over to fold up the end of the hat to form a brim. Row 1: working into the 2nd chain from the hook single crochet, single crochet in every chain across, turn your work. Row 2: chain 1, starting in the first stitch single crochet in the back loop, single crochet in the back loop of every st across, (change colors), turn your work. 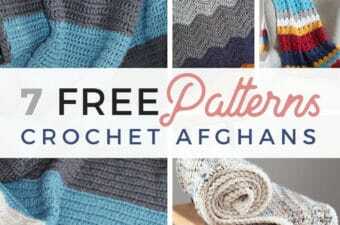 Row 3 -your desired width: Repeat 2 changing colors every two rows. End with a pink row if possible. Fasten off. Finishing: Weave in all the loose ends with a yarn needle. Holding the two ends together whip stitch the two short ends of the hat together to form a large tube. Along the top open end close your hat using the method shown “here“. 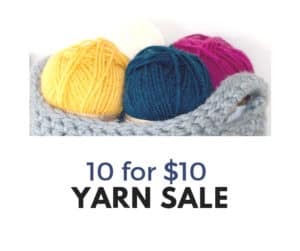 It is the same method I used to close my Simply Sweet Beanie. Pom Pom: this part is optional but I think it really finishes off the hat nicely. 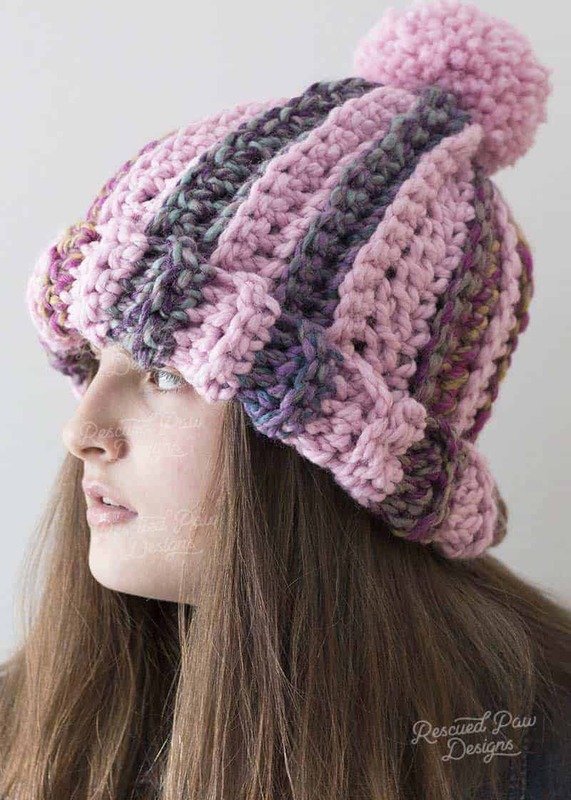 Using a large Clover Pom Pom Maker and the Blossom Wool Ease Thick & Quick make a pom! If you want it extra fluffy like mine be sure to add a TON of yarn and you will get the same look. Attach the pom with a yarn needle and fasten securely to the hat. That’s it! 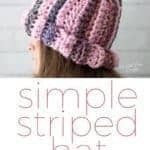 You have completed the simple striped crochet hat! You did it! 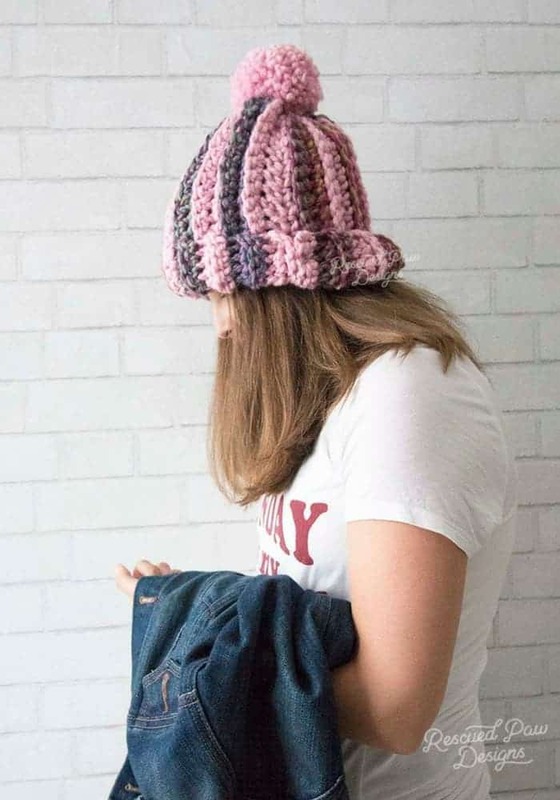 Did you think this was a quick and easy crochet hat? I hope so! 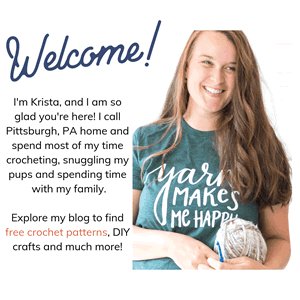 If you are looking for other crochet hats for beginners then click here to explore my free crochet hat patterns!